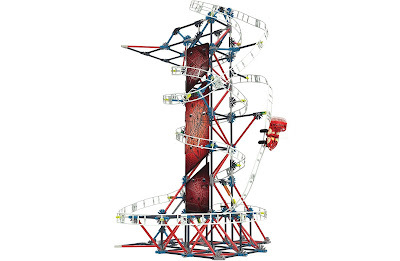 K'NEX are probably best known for producing roller coaster toy sets, yet despite having reviewed lots of different K'NEX sets over the last 18 months, this is only our second coaster review. 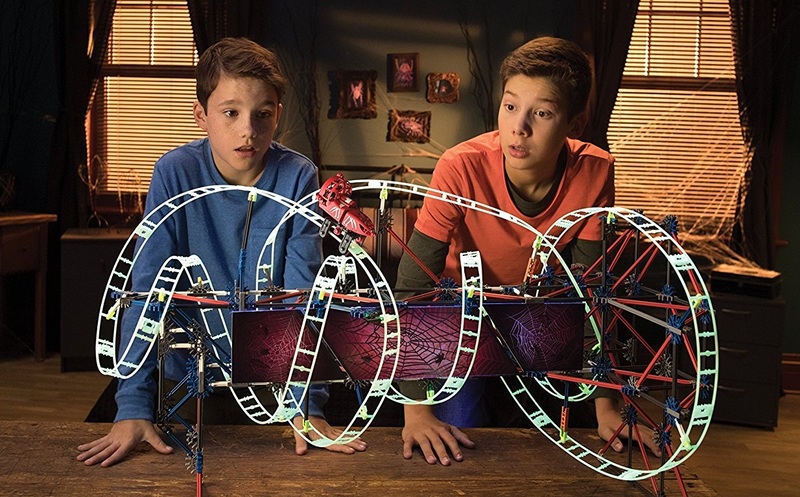 Just in time for Halloween (and making a great Halloween gift, BTW) we clip the track together and have some spooky fun with the K'Nex Web Weaver Roller Coaster. 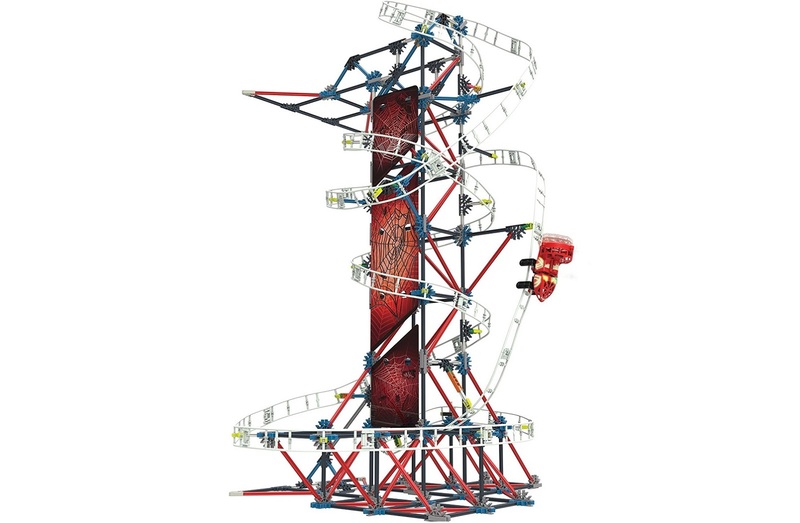 So how does the Web Weaver differ to the previous coaster we reviewed, the Electric Inferno? Well, despite having fewer parts (439 to the Electric's 639) the Web Weaver is actually larger and offers a lot more value. Almost the entire build is made from the same size of K'NEX rod, joined together with an array of connectors. Whereas the previous coaster spent lots of its parts count on a long chain piece to pull the car upwards, the Weaver gives you actual usable parts that can be used for other builds. So that's a win, right out of the box. The construction of the set took us a leisurely 90 minutes or so. There are no fiddly small parts, and even wrapping the flexible glow-in-the-dark track around the main tower was a simple affair. Most of the time was spent building that very involved, and very structurally sound, central section. Watching it grow was really pleasurable. Once the build is finsihed, and once you attach the decorative (but not at all nessisary) cardboard panel pieces with web details, you can attach the car to the track. Unlike the Electric Inferno's car, which was a plain wheeled job relaying only on gravity, the Web Weaver's is powered. Behind that red safely grill is a propeller, which, once you charge the car's battery via the included USB cable, will push out quite a lot of force. Think of it as a single prop from a quadcopter. So yes, it will nip your fingers if you reach into that cage. Bloody hell, its quick. So quick in fact, and pushed along with such force from the prop, that the whole things wobbles slightly, even when in horizontal mode. Still, it held together well, even after we let the car run for the full life of the battery - about five minutes. Actually, that slight wobble seemed to help it stay together, as when we firmly held the base to the floor and let the car run we had the occasional instance of the track coming loose from one of the connectors that secures it to the main frame. Nothing that we couldn't instantly fix, mind. 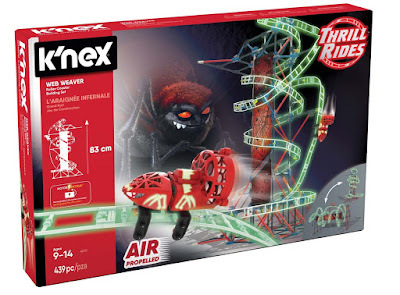 As the track pieces glow-in-the-dark, it makes playing with the K'NEX Web Weaver Roller Coaster in the low-light quite fun. We would have appreciated some lights on the car, as that would have vastly enhanced night-time play, but the fact that the whole thing glows is pretty cool. Apart from the aforementioned decorative panels, the only other nod to spiders and webs are the stickers applied to the car. Being able to position the roller coaster sideways and still have it run normally is also quite unique. We suppose it is because the coaster is not dependant on gravity; a first for a K'NEX coaster as far as we know. 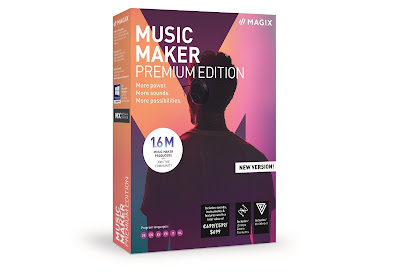 This also means kids can get creative when building their own coasters, and another set of instructions are included. With so many non-specific and useful parts included, it should be easy to make something else. 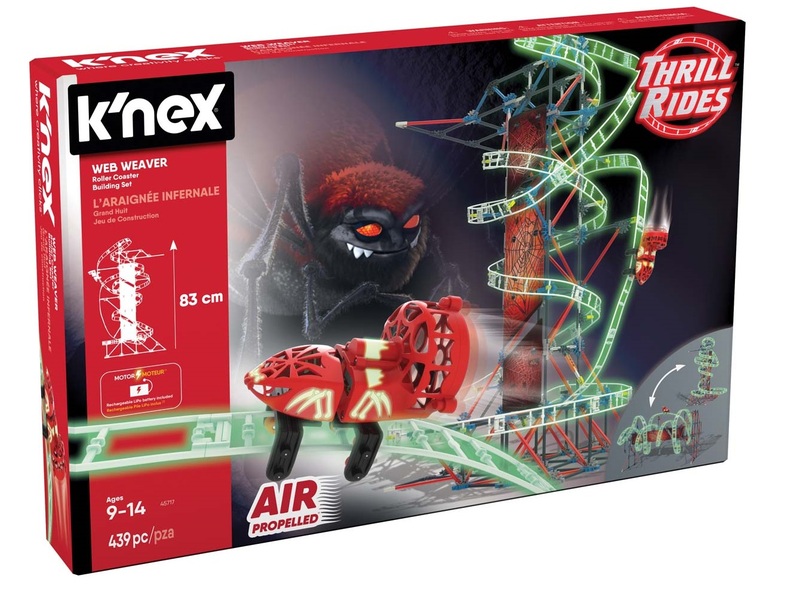 So although we really love K'NEX's range of K-Force build-your-own blasters, we have to go on the record and say that the Web Weaver Roller Coaster is by far our favourite K'NEX set set so far. A fun build, some great parts with lots of value, and an exhilarating operation. For Halloween, and for any other time, this is a great addition to the playroom.